Language accommodation for voting (or the lack thereof) could swing 20 congressional elections. A voter enters a polling place with instructions written in English, Spanish, Chinese and Korean in Chinatown November 7, 2006 in New York City. As Americans go to the polls tomorrow, one group of people will have a harder time of it than most. They are the 5.78 million eligible voters who have Limited English Proficiency (LEP) and who do not receive federal language accommodations with voting. LEP voters may speak some English, but can’t speak, read, or write English well enough to understand complex ballot questions. According to our conservative estimate, more than 270,000 unaccommodated LEP voters live in 20 of the country’s most hotly contested congressional districts; in nearly all of them, the number of eligible LEP voters is greater than the estimated difference in vote share according to polling forecasts. Since 1975, the federal Voting Rights Act has mandated that local election officials provide language accommodations whenever the LEP population reaches certain thresholds. In those jurisdictions, all information that is provided in English must be provided accurately in the minority language or languages as well. Bilingual poll workers who speak the minority language or languages must be recruited, and administrators need to conduct outreach campaigns to tell voters about the accommodation. But if the LEP community doesn’t reach the required threshold, none of these requirements apply. An estimated 5.78 million voters with Limited English Proficiency (LEP) will not get federal language accommodations during the 2018 midterms. More than 270,000 unaccommodated LEP voters live in 20 hotly contested congressional districts; in nearly all of them, the number of eligible LEP voters is greater than the estimated difference in vote share. Even in counties that have federal language accommodations, coverage only applies to the languages that reach a certain threshold, and the languages are limited to a list Congress created in 1975. Today's LEP population includes 345,000 Haitian Creole speakers, 401,000 Russian speakers, and 456,000 Arabic speakers. Still, the largest number of unaccommodated voters are Spanish-speaking: 1.9 million. Dan Miller is a senior data analyst at Global Strategy Group, a polling company with ties to Democratic politicians. “It’s certainly possible that some House races could be swayed by this,” he said, referring to the population of unaccommodated LEP voters. “Ballot materials not being available in a usable form for even 5 percent of the population could make a difference. It’s especially important this year, because there’s some possibility that control of the House could be decided by only a few seats.” Miller also noted that not voting in one election cycle makes campaigns less likely to reach out to that person in the future, perpetuating a cycle of invisibility and nonparticipation in the electoral process. “At the end of the day, without meaningful language assistance, many voters simply would not be able to cast a meaningful and effective ballot,” said Kristen Clarke, president of the civil-rights advocacy group Lawyers’ Committee for Civil Rights Under Law. The Investigative Fund analyzed publicly available census data to identify Limited English Proficiency citizens over the age of 18. There are more than 11 million of them, and all are eligible voters unless their franchise is restricted because of a past felony conviction. According to calculations verified by the U.S. Census Bureau, more than half of them are not covered by a federal accommodation. These LEP voters won’t all vote, and won’t all vote for the same political party, but, in the aggregate, they are a large enough group that language accommodation for voting could help swing 20 competitive congressional elections. Yet, outside immigrant-advocacy circles, few seem to have noticed. Almost immediately after it was passed in 1965, the Voting Rights Act was recognized as a crowning legislative achievement of the civil-rights movement. It established federal oversight of elections in nine states with a history of using voter-suppression tactics against black Americans, including Georgia, Virginia, and parts of Arizona. A decade later, when the law was being re-authorized for the second time, its effectiveness seemed clear—soon after its passage, nearly one million black Americans had newly registered to vote—but some problems were also coming to light. Puerto Rican and Chicano voters and candidates testified at congressional hearings that they, too, faced intimidation and coercion, and that many members of their communities had difficulty understanding ballot questions in English. Salame’s reporting on unaccommodated voters with limited English was translated to Spanish on Univision. 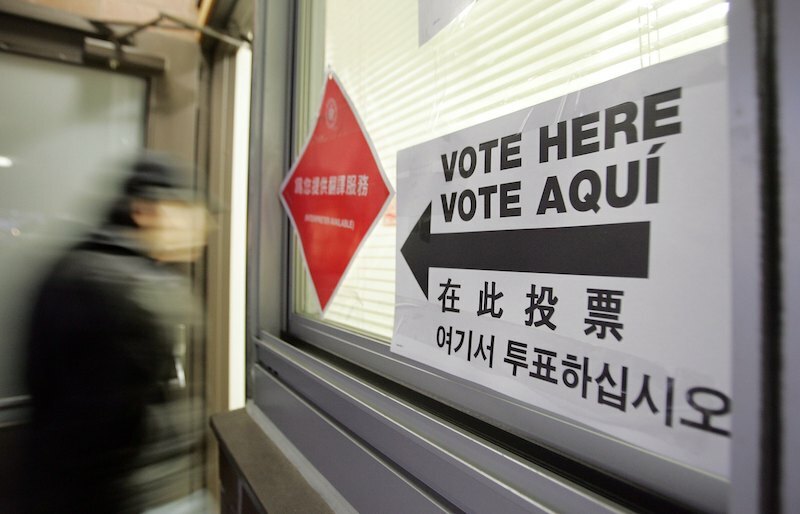 Congress concluded that Hispanic, Asian, and Native voters needed language accommodations. According to Terry Ao Minnis, director of census and voting programs at the advocacy group Asian Americans Advancing Justice, legislators realized that these Americans “were similarly depressed in their voting participation as African Americans were and recognized that that was due in large part to language barriers.” Congress added these “language minorities” to general anti-discrimination provisions and created a federal language-accommodation regime for elections: Section 203. Section 203 mandated that if the Census Bureau determined that 5 percent of a jurisdiction’s electorate were members of a single language minority and that their illiteracy rate in English was greater than the national English illiteracy rate, every aspect of elections had to be made bilingual in that language. In 1992, language minorities that had 10,000 LEP citizens and higher than average rates of English illiteracy in a jurisdiction also gained coverage, regardless of what percent they are of the total. Since 2016, when the Census Bureau did its most recent round of determinations, 263 counties and county-equivalents out of 3,141 nationwide have triggered Section 203 protections for Spanish and Native and Asian languages, with three states triggering statewide Spanish accommodations—California, Florida, and Texas. “Asian” languages are defined as languages spoken by “Asian” people, who the Office of Management and Budget classifies as peoples of the “Far East,” “Southeast Asia,” and “the Indian subcontinent,” but not Russia or western Asia. But coverage is not universal within those 263 counties: It applies only to the languages that reach the numerical threshold, and the realm of possible languages is limited to the list Congress created in 1975. Although Congress has reauthorized the Voting Rights Act numerous times since then, and has rejected repeated Republican attempts to eliminate Section 203, it has not expanded the list of languages that can be accommodated, and the consequences of that stasis are becoming increasingly apparent. The LEP population today is more diverse than ever. There are 345,000 LEP Haitian-Creole speakers living in the United States, 401,000 LEP Russian speakers, and 456,000 LEP Arabic speakers, none of whom are eligible for Section 203 accommodations. Still our analysis shows that the largest number of unaccommodated voters are Spanish-speaking. There are 1.9 million Spanish-speaking LEP voters whose communities fall below the Section 203 thresholds, and some of the closest races, as of two days before the midterms, have an estimated difference in vote share between the candidates of 0.1 and 0.2. Yet many local governments are loathe to provide accommodations voluntarily. The state of Georgia, which has recently made national headlines for voter purges, does not have a track record of accommodating minority voters voluntarily. The state, home to more than 165,000 LEP voters, currently has only one language accommodation, for Spanish in Gwinnett County. And even getting that was a fight. “We were making the case for voluntary expansion of language access [in Gwinnett County] prior to the Section 203 designation that happened in 2016,” said Jerry Gonzalez, an organizer with the advocacy group Georgia Association of Latino Elected Officials (GALEO). “But the county officials said it’s going to have to be mandated federally, or you’re going to have to sue us, or it’s not going to happen.” In December 2016, the Census Bureau determined that the county was required to provide Spanish accommodations under the Voting Rights Act. Georgia voter Gabriel Velasquez said that he was accosted two weeks ago while translating the monolingual English ballot into Spanish for someone else who was also waiting in line for the polling place in Hall County, Georgia. An older white woman accused him of trying to influence the other man’s vote, he said, and poll workers called over a police officer who resolved the situation by ordering Velasquez not to talk in line, a series of escalations Velasquez said felt like intimidation. In 2016, a Gwinnett County poll worker allegedly told a volunteer Spanish translator, “if they can’t speak English, we don’t want them here.” The incident cost the poll worker her job, but GALEO’s Gonzalez said it’s indicative of the type of animosity and hostility minority voters face in the county. New York’s 11th District is the only congressional district in New York City to be represented by a Republican. It is also one of the nation’s most extreme examples of under-accommodation of LEP voters. Between 11.1 and 16.2 percent of voters are not accommodated under the Voting Rights Act, in a district where the Republican incumbent leads his Democratic challenger by a mere 4.8 points, as of 12 p.m. on November 4. The problem of unaccommodated LEP New Yorkers is something New York City’s Mayor’s Office of Immigrant Affairs (MOIA) is beginning to address with the expansion this year of a pilot language accommodation scheme that will go beyond the VRA’s list of accommodated languages. MOIA plans to post Russian, Haitian-Creole, Italian, Arabic, Polish, and Yiddish interpreters outside 101 polling places, 12 of them in the 11th District. All 12 of those will have Russian interpreters and one site will also have Arabic. In accordance with stipulations by the State Board of Elections, MOIA interpreters must remain over 100 feet away from the polling places. Activist Somia Elrowmeim—a leader in the Arab-American Association of New York and Yalla Brooklyn, who was one of the volunteer translators expelled that day—keeps a stack of handwritten testimonials in her office. On various scraps of paper, voters wrote out in Arabic or English their stories about not being able to vote. They represent a fraction of the approximately 200 complaints her colleague Awawdeh said he received, roughly 70 percent of which he says related to language access. Interviews in Arabic and English with more than half a dozen Arabic speakers in the district suggest that there is widespread anxiety and ambivalence about engaging in the political process. According to Zein Rimawi, who runs the popular An-Noor social center, which hosts political and social meetings and events, this stems from a lack of knowledge about civics in the United States. Arab immigrants who came to the US as adults, he said, don’t always recognize that American elections are different from elections in the Arab world, which are often plagued by serious fraud and surveillance. Others worry about feeling embarrassed at the polling place if they don’t understand the ballot and if poll workers are rude and aggressive. At the extreme end, there are concerns about provoking a response from the white majority. “[Arab citizens] don’t participate because they’re scared. They don’t know what will happen, and they’re scared if they participate in something, there will be retaliation against them or their presence here,” said Halimah al-Sawadi, who has door-knocked and phone banked for immigrant-advocacy groups in this election cycle. As MOIA’S pilot program expands, it may eventually provide Arabic interpreters to this neighborhood on Election Day. Tomorrow, voters have the opportunity to approve a proposed amendment to the city charter to build on MOIA’s electoral language-access work. But in the meantime, activists are organizing to build a habit of civic participation no matter what. “Getting people used to voting is really important,” Awawdeh said. Utah’s 4th is home to another close congressional race, with Republican Mia Love leading her Democratic opponent Ben McAdams by just 1.8 points as of noon on November 4. That margin is eclipsed by the 3.19 percent of the electorate that is made up of unaccommodated LEP voters. From 2011 to 2016, Salt Lake County, which contains most of the district’s population, was covered under Section 203, but it fell short in the 2016 count. With a race this tight, even little things could make a difference. Tim Chambless, a political-science professor at the University of Utah, said that the simple act of providing the ballot in Spanish could be enough to affect the outcome in the 4th District. But Maria Montes of local Latino community-organizing group Comunidades Unidas said the impact of the accommodation was lessened by the fact that community organizations weren’t aware of it until just a month before the election. Implementation problems have been more serious in San Diego County where, for the first time in California history, Arabic facsimile ballots are being posted to 180 precincts so LEP voters can reference them. California has the strongest language-access law in the country, providing accommodations to any LEP language minority that reaches a 3 percent threshold in a precinct. Iyad Afalqa, chair of the Arab-American caucus of the California Democratic Party, said he has been working with state officials on winning language access for his community for five years, but was not notified when the language-accommodation announcement was made in January. He said no one in his community was aware of the accommodation, making it less likely LEP voters will use it. In a recording Afalqa shared with us, he called the voter help line that was advertised in Arabic on official San Diego County documents. After nearly 25 minutes, the supervisor told him, incorrectly, that no Arabic ballots would be available until the 2020 election. When I called the hotline two separate times on November 1, speaking in Arabic, I was put on hold for 20 minutes and then informed that there were no Arabic speakers available on the hotline and there are no Arabic ballots. This was three weeks into the early voting period, which began in San Diego County on October 8. For LEP voters who are not accommodated under Section 203, there exists another provision of the Voting Rights Act that applies to every LEP voter, everywhere. Section 208 allows anyone unable to read and write on the ballot because of language proficiency or disability to bring virtually anyone of their choosing with them to help them vote; the only restrictions are on representatives of the voter’s employer or union. It’s a crucially important catch-all, even in jurisdictions with strong language-access policies, because it allows voters to bring someone they feel comfortable with into the unfamiliar environment of the polling place. For instance, explained Philadelphia Commissioner Al Schmidt, voters there routinely bring friends and relatives to interpret at poll sites, even though the city has bilingual ballots in English and Spanish and Spanish-language interpreters. This article was reported in collaboration with The Investigative Fund at The Nation Institute, now known as Type Investigations. Richard Salame is a journalist and assistant editor at Type Investigations.